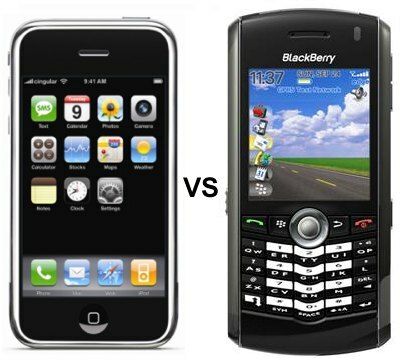 Blog Readers Chose iPhone Over Blackberry Pearl | BlackBerry Blast! At the ZDNet IP Telephony/Convergence/Broadband Blog, Russell Shaw has asked his readers to choose which device they would rather have -- the new Apple iPhone, or the Blackberry Pearl? Both devices have music and video playback, camera, Web surfing, and organizer functions but only one has the "cool" factor, apparently. By an overwhelming margin (so far), Mr. Shaw's readers have chosen the Apple iPhone. This is interesting as nobody really has their hands on the iPhone yet. Check out the Full Story link for more.